Simple Songwriter—a $2 app from Hopefully Useful Software—aims to help musicians—beginners and advanced alike—assemble pop song ideas from the assortment of complementary chords it offers. Music Muse: Simple Songwriter’s unattractive-though-functional screen presents you with nine chords—three major, three minor, and three extras with modifiers for inversions and sevenths. It sort of works. On the whole, though, Simple Songwriter seems a bit too advanced for beginners, and much too rudimentary for experts. The app’s main screen is ugly, but functional. You’re presented with three major chords, three minor chords, and three “extra” chords, along with modifiers for inversions and sevenths. When you tap a chord, you’ll immediately hear it played with a Midi-esque piano sound. If you tap and hold on one of the modifiers, the chord names adjust accordingly. Finger placement can start to feel a bit like a hands-only game of Twister if you’re attempting to play a progression with a variety of inversions or sevenths. That said, it’s workable. Novices will appreciate that the nine offered chords (along with their variants) sound pretty good in a lot of patterns. Music theorists will note that Simple Songwriter follows the Circle of Fifths approach. And while many pop songs use some variant of the chord progressions Simple Songwriter offers, sometimes the nine chords presented just aren’t enough, and you’ll need to seek out your instrument of choice to get at the chord you crave. Mercifully, the app does allow you to change the key you’re playing in, on the aptly named Key tab. I’ve grown to dread that tab, though; as you flick through the available keys, if you stop on the wrong one, you’re forced to wait several long seconds while Simply Music loads the corresponding chords. Then you’re forced to wait all over again after you scroll back up the right chord. You can record your musical inspirations and save them within the app. That way, if inspiration strikes and you happen upon some musical genius that you can’t afford to forget, you can save it and play it back later. An optional metronome can provide a click track for up to 200 beats per minute. Unfortunately, although you can see all the chords that make up your recording, you can’t edit them. If you make a mistake right at the end and want your recording perfect, you’ll have to start over from the beginning. Simple Songwriter shines, however, when playing back your opus: The name of each chord is prominently displayed as it plays, big enough that you can plop your iPhone down on your desk while you strum your guitar or bang along on your piano. Beginners will likely see Simple Songwriter as a toy, fun for playing chord-based music in entertaining sequences—and not much else. More advanced musicians might appreciate the ability to try out and easily save new chord patterns on-the-go. But Simple Songwriter’s intentional (and namesake) simplicity feels a bit too stifling for true musical creativity. 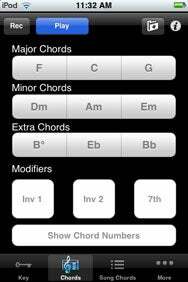 Simple Songwriter is compatible with any iPhone or iPod touch running the iPhone 2.2.1 software update.